"Stillborn" redirects here. For other uses, see Stillborn (disambiguation). Stillbirth is typically defined as fetal death at or after 20 to 28 weeks of pregnancy. It results in a baby born without signs of life. A stillbirth can result in the feeling of guilt in the mother. The term is in contrast to miscarriage which is an early pregnancy loss and live birth where the baby is born alive, even if it dies shortly after. Often the cause is unknown. Causes may include pregnancy complications such as preeclampsia and birth complications, problems with the placenta or umbilical cord, birth defects, infections such as malaria, and poor health in the mother. Risk factors include a mother's age over 35, first pregnancy, smoking, drug use and use of assisted reproductive technology. Stillbirth may be suspected when no fetal movement is felt. Confirmation is by ultrasound. Worldwide prevention of most stillbirths is possible with improved health systems. About half of stillbirths occur during childbirth, with this being more common in the developing than developed world. Otherwise depending on how far along the pregnancy is, medications may be used to start labor or a type of surgery known as dilation and evacuation may be carried out. Following a stillbirth, women are at higher risk of another one; however, most subsequent pregnancies do not have similar problems. Depression, financial loss, and family breakdown are known complications. Worldwide in 2015 there were about 2.6 million stillbirths that occurred after 28 weeks of pregnancy (about 1 for every 45 births). They occur most commonly in the developing world, particularly South Asia and sub Saharan Africa. In the United States for every 167 births there is one stillbirth. Rates of stillbirth in the United States have decreased by about 2/3rds since the 1950s. There are a number of definitions for stillbirth. To allow comparison, the World Health Organization recommends that any baby born without signs of life at greater than or equal to 28 completed weeks' gestation be classified as a stillbirth. Others use greater than any combination of 16, 20, 22, 24, or 28 weeks gestational age or 350g, 400g, 500g, or 1000g birth weight may be considered stillborn. The term is often used in distinction to live birth (the baby was born alive, even if it died shortly thereafter) or miscarriage (early pregnancy loss). The word miscarriage is often used incorrectly to describe stillbirths. The term is mostly used in a human context, however the same phenomenon can occur in all species of placental mammals. There is currently, as of 2016, no international classification system for stillbirth causes. The causes of a large percentage of human stillbirths remain unknown, even in cases where extensive testing and autopsy have been performed. A rarely used term to describe these is "sudden antenatal death syndrome" or SADS, a phrase coined by Cacciatore & Collins in 2000. Many stillbirths occur at full term to apparently healthy mothers, and a postmortem evaluation reveals a cause of death in only about 40% of autopsied cases. Prolapsed umbilical cord – Prolapse of the umbilical cord happens when the fetus is not in a correct position in the pelvis. Membranes rupture and the cord is pushed out through the cervix. When the fetus pushes on the cervix, the cord is compressed and blocks blood and oxygen flow to the fetus. The mother has approximately 10 minutes to get to a doctor before there is any harm done to the fetus. Monoamniotic twins – These twins share the same placenta and the same amniotic sac and therefore can interfere with each other's umbilical cords. When entanglement of the cords is detected, it is highly recommended to deliver the fetuses as early as 31 weeks. Umbilical cord length - A short umbilical cord (<30 cm) can affect the fetus in that fetal movements can cause cord compression, constriction and ruptures. A long umbilical cord (>72 cm) can affect the fetus depending on the way the fetus interacts with the cord. Some fetuses grasp the umbilical cord but it is yet unknown as to whether a fetus is strong enough to compress and stop blood flow through the cord. Also, an active fetus, one that frequently repositions itself in the uterus can cause entanglement with the cord. A hyperactive fetus should be evaluated with ultrasound to rule out cord entanglement. 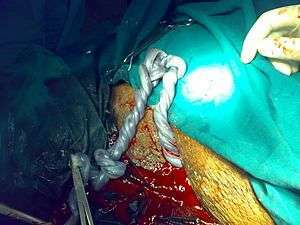 Cord entanglement - The umbilical cord can wrap around an extremity, the body or the neck of the fetus. When the cord is wrapped around the neck of the fetus, it is called a nuchal cord. These entanglements can cause constriction of blood flow to the fetus. These entanglements can be visualized with ultrasound. Torsion – This term refers to the twisting of the umbilical around itself. Torsion of the umbilical cord is very common (especially in equine stillbirths) but it is not a natural state of the umbilical cord. The umbilical cord can be untwisted at delivery. The average cord has 3 twists. After a stillbirth there is a 2.5% risk of another stillbirth in the next pregnancy (an increase from 0.4%). It is unknown how much time is needed for a fetus to die. Fetal behavior is consistent and a change in the fetus' movements or sleep-wake cycles can indicate fetal distress. A decrease or cessation in sensations of fetal activity may be an indication of fetal distress or death, though it is not entirely uncommon for a healthy fetus to exhibit such changes, particularly near the end of a pregnancy when there is considerably less space in the uterus than earlier in pregnancy for the fetus to move about. 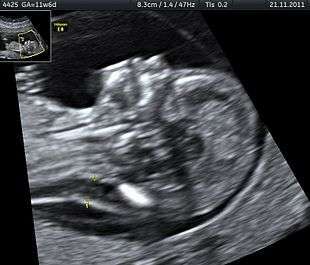 Still, medical examination, including a nonstress test, is recommended in the event of any type of any change in the strength or frequency of fetal movement, especially a complete cease; most midwives and obstetricians recommend the use of a kick chart to assist in detecting any changes. Fetal distress or death can be confirmed or ruled out via fetoscopy/doptone, ultrasound, and/or electronic fetal monitoring. If the fetus is alive but inactive, extra attention will be given to the placenta and umbilical cord during ultrasound examination to ensure that there is no compromise of oxygen and nutrient delivery. Some researchers have tried to develop models to identify early on pregnant women who may be at high risk of having a stillbirth. When the umbilical cord is constricted (q.v. "accidents" above), the fetus experiences periods of hypoxia, and may respond by unusually high periods of kicking or struggling, to free the umbilical cord. These are sporadic if constriction is due to a change in the fetus' or mother's position, and may become worse or more frequent as the fetus grows. Extra attention should be given if mothers experience large increases in kicking from previous childbirths, especially when increases correspond to position changes. Regulating High blood pressure, diabetes and drug use may reduce the risk of a stillbirth. Umbilical cord constriction may be identified and observed by ultrasound, if requested. Some maternal factors are associated with stillbirth, including being age 40 or older, having diabetes, having a history of addiction to illegal drugs, being overweight or obese, and smoking cigarettes in the three months before getting pregnant. Fetal death in utero does not present an immediate health risk to the woman, and labour will usually begin spontaneously after two weeks, so the woman may choose to wait and bear the fetal remains vaginally. After two weeks, the woman is at risk of developing blood clotting problems, and labor induction is recommended at this point. In many cases, the woman will find the idea of carrying the dead fetus emotionally traumatizing and will elect to have labor induced. Caesarean birth is not recommended unless complications develop during vaginal birth. Women need to heal physically after a stillbirth just as they do emotionally. They will go through the healing process afterwards just as they would after a normal healthy birth. The average stillbirth rate in the United States is approximately 1 in 160 births, which is roughly 26,000 stillbirths each year. In Australia, England, Wales, and Northern Ireland, the rate is approximately 1 in every 200 births; in Scotland, 1 in 167. The vast majority of stillbirths worldwide (98%) happen in low and middle-income countries, where medical care can be of low quality or unavailable. Reliable estimates calculate that yearly about 2.6 million stillbirths occur worldwide during the third trimester. Stillbirths were previously not included in the global burden of disease that records worldwide deaths from various causes until 2015. The way people view stillbirths has changed dramatically over time, however its economic and psychosocial impact is often under estimated. In the early 20th century, when a stillbirth occurred, the baby was taken and discarded and the parents were expected to immediately let go of the attachment and try for another baby. In many countries parents are expected by friends and family members to recover from the loss of an unborn baby very soon after it happens. Societally-mediated complications such as financial hardship and depression are among the more common results. 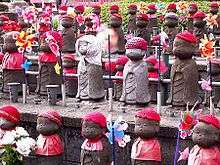 In Japan, statues of Jizo, a Buddhist patron deity of children, memorialize stillborn babies. In Australia any stillborn weighing more than 400 grams, or more than 20 weeks in gestation, must have its birth registered. In Austria a stillbirth is defined as birth of a child of at least 500 g weight without vital signs, e.g. blood circulation, breath or muscle movements. "Fetal death" means death prior to the complete expulsion or extraction from its mother of a product of human conception, irrespective of the duration of pregnancy and which is not an induced termination of pregnancy. The death is indicated by the fact that after such expulsion or extraction, the fetus does not breathe or show any other evidence of life, such as beating of the heart, pulsation of the umbilical cord, or definite movement of voluntary muscles. Heartbeats are to be distinguished from transient cardiac contractions; respirations are to be distinguished from fleeting respiratory efforts or gasps. In Germany a stillbirth is defined as birth of a child of at least 500g weight without blood circulation or breath. Details for burial vary amongst the federal states. At one time, this Angels' Plot was one of the few burial grounds for stillborn babies that was consecrated by the Catholic Church in Ireland. "...a child weighing at least 500 grammes, or having reached a gestational age of at least 24 weeks who shows no signs of life." In the Netherlands, stillbirth is defined differently by the central bureau of statistics (CBS) and the Dutch perinatal registry (Stichting PRN). The birth and mortality numbers from the CBS include all liveborn children, regardless of gestational duration and all stillbirths from 24 weeks of gestation and onwards. In the Perinatal Registry, gestational duration of both liveborn and stillborn children is available. They register all liveborn and stillborn children from 22, 24 or 28 weeks of gestation and onwards (dependent on the report: fetal, neonatal or perinatal mortality). Therefore, data from these institutions on (still)births can not simply be compared one-on-one. The registration of still-births has been required in England and Wales from 1927, in Scotland from 1939 but is not required in Northern Ireland. Sometimes a pregnancy is terminated deliberately during a late phase, for example for congenital anomaly. UK law requires these procedures to be registered as "stillbirths". "still-born" and "still-birth" shall apply to any child which has issued forth from its mother after the twenty fourth week of pregnancy and which did not at any time after being completely expelled from its mother, breathe or show any other signs of life. A similar definition is applied within the Births and Deaths Registration Act 1953 (as amended), contained in s.41. The above definitions apply within those Acts thus other legislation will not necessarily be in identical terms. s.2 of the 1953 Act requires that registration of a birth takes place within 42 days of the birth except where an inquest takes place or the child has been "found exposed" in which latter case the time limit runs from the time of finding. Extracts from the register of still-births are restricted to those who have obtained consent from the Registrar General for England and Wales. Except so far as otherwise provided by this section or as may be prescribed, the provisions of this Part of this Act shall, so far as applicable, apply to still-births in like manner as they apply to births of children born alive. In the general case, s.14 of the Act requires that a birth has to be registered within 21 days of the birth or of the child being found. Unlike the registers for births, marriages, civil partnerships and deaths, the register of still-births is not open to public access and issue of extracts requires the permission of the Registrar General for Scotland. "still-birth" means the complete expulsion or extraction from its mother after the twenty-fourth week of pregnancy of a child which did not at any time after being completely expelled or extracted breathe or show any other evidence of life. In the United States, there is no standard definition of the term 'stillbirth'. In the U.S., the Born-Alive Infants Protection Act of 2002 specifies that any breathing, heartbeat, pulsating umbilical cord, or confirmed voluntary muscle movement indicate live birth rather than stillbirth. The federal guidelines recommend reporting those fetal deaths whose birth weight is over 12.5 oz (350g), or those more than 20 weeks gestation. Forty-one areas use a definition very similar to the federal definition, thirteen areas use a shortened definition of fetal death, and three areas have no formal definition of fetal death. Only 11 areas specifically use the term 'stillbirth', often synonymously with late fetal death, however they are split between whether stillbirths are "irrespective of the duration of pregnancy", or whether some age or weight constraint is applied. A movement in the U.S. has changed the way that stillbirths are documented through vital records. Previously, only the deaths were reported. However 27 states have enacted legislation that offers some variation of a birth certificate as an option for parents who choose to pay for one. Parents may not claim a tax exemption for stillborn infants, even if a birth certificate is offered. To claim an exemption, the birth must be certified as live, even if the infant only lives for a very brief period. 1 2 3 "Stillbirth: Overview". NICHD. 23 September 2014. Retrieved 4 October 2016. 1 2 3 4 5 6 7 8 "Stillbirths". World Health Organization. Retrieved 2016-09-29. 1 2 Robinson, GE (January 2014). "Pregnancy loss.". Best practice & research. Clinical obstetrics & gynaecology. 28 (1): 169–78. doi:10.1016/j.bpobgyn.2013.08.012. PMID 24047642. ↑ "What are possible causes of stillbirth?". NICHD. 23 September 2014. Retrieved 4 October 2016. ↑ "What are the risk factors for stillbirth?". NICHD. 23 September 2014. Retrieved 4 October 2016. ↑ "How is stillbirth diagnosed?". NICHD. 23 September 2014. Retrieved 4 October 2016. 1 2 "Ending preventable stillbirths An Executive Summary for The Lancet's Series" (PDF). The Lancet. Jan 2016. ↑ "How do health care providers manage stillbirth?". NICHD. 23 September 2014. Retrieved 4 October 2016. ↑ "Stillbirth: Other FAQs". NICHD. 23 September 2014. Retrieved 4 October 2016. 1 2 "How common is stillbirth?". NICHD. 23 September 2014. Retrieved 4 October 2016. ↑ Nguyen RH, Wilcox AJ (December 2005). "Terms in reproductive and perinatal epidemiology: 2. Perinatal terms". J Epidemiol Community Health. 59 (12): 1019–21. doi:10.1136/jech.2004.023465. PMC 1732966 . PMID 16286486. There is probably no health outcome with a greater number of conflicting, authoritative, legally mandated definitions. The basic WHO definition of fetal death is the intrauterine death of any conceptus at any time during pregnancy. However, for practical purposes, legal definitions usually require recorded fetal deaths to attain some gestational age (16, 20, 22, 24, or 28 weeks) or birth weight (350, 400, 500, or 1000 g). In the US states, there are eight different definitions by combinations of gestational age and weight, and at least as many in Europe. ↑ Leisher, Susannah Hopkins; Teoh, Zheyi; Reinebrant, Hanna; Allanson, Emma; Blencowe, Hannah; Erwich, Jan Jaap; Frøen, J. Frederik; Gardosi, Jason; Gordijn, Sanne (2016-01-01). "Classification systems for causes of stillbirth and neonatal death, 2009–2014: an assessment of alignment with characteristics for an effective global system". BMC Pregnancy and Childbirth. 16: 269. doi:10.1186/s12884-016-1040-7. ISSN 1471-2393. ↑ Collins JH (February 2002). "Umbilical cord accidents: human studies". Semin. Perinatol. 26 (1): 79–82. doi:10.1053/sper.2002.29860. PMID 11876571. 1 2 3 Joanne, Cacciatore, (2007-01-01). A phenomenological exploration of stillbirth and the effects of ritualization on maternal anxiety and depression (Thesis). University of Nebraska - Lincoln. 1 2 3 Lawn, Joy E; Blencowe, Hannah; Waiswa, Peter; Amouzou, Agbessi; Mathers, Colin; Hogan, Dan; Flenady, Vicki; Frøen, J Frederik; Qureshi, Zeshan U; Calderwood, Claire; Shiekh, Suhail; Jassir, Fiorella Bianchi; You, Danzhen; McClure, Elizabeth M; Mathai, Matthews; Cousens, Simon (2016). "Stillbirths: rates, risk factors, and acceleration towards 2030". The Lancet. 387 (10018): 587–603. doi:10.1016/S0140-6736(15)00837-5. ISSN 0140-6736. ↑ Saccone G, Berghella V, Sarno L, Maruotti GM, Cetin I, Greco L, Khashan AS, McCarthy F, Martinelli D, Fortunato F, Martinelli P (Oct 9, 2015). "Celiac disease and obstetric complications: a systematic review and metaanalysis". Am J Obstet Gynecol. pii: S0002-9378 (15): 01194–1. doi:10.1016/j.ajog.2015.09.080. PMID 26432464. ↑ Lamont, K; Scott, NW; Jones, GT; Bhattacharya, S (24 June 2015). "Risk of recurrent stillbirth: systematic review and meta-analysis.". BMJ (Clinical research ed.). 350: h3080. doi:10.1136/bmj.h3080. PMID 26109551. ↑ Kayode, Gbenga A.; Grobbee, Diederick E.; Amoakoh-Coleman, Mary; Adeleke, Ibrahim Taiwo; Ansah, Evelyn; de Groot, Joris A. H.; Klipstein-Grobusch, Kerstin (2016). "Predicting stillbirth in a low resource setting". BMC Pregnancy and Childbirth. 16 (1). doi:10.1186/s12884-016-1061-2. ISSN 1471-2393. ↑ WebMD (December 14, 2011). "Studies identify stillbirth risk factors, causes". CBS News. Retrieved 2013-08-06. ↑ "Placental, pregnancy conditions account for most stillbirths". U.S. Department of Health and Human Services. NIH News (December 13, 2011). Retrieved 2013-08-30. ↑ Gordon, Adrienne (Dr). "Department of Neonatal Medicine Protocol Book: Royal Prince Alfred Hospital". Retrieved 2006-09-13. ↑ "Statistical bulletin: Live Births, Stillbirths and Infant Deaths, Babies Born in 2009 in England and Wales". Office for National Statistics. 21 June 2012. ↑ "Global, regional, national, and selected subnational levels of stillbirths, neonatal, infant, and under-5 mortality, 1980–2015: a systematic analysis for the Global Burden of Disease Study 2015". The Lancet. 388 (10053): 1725–1774. 2016. doi:10.1016/S0140-6736(16)31575-6. ISSN 0140-6736. ↑ Heazell, Alexander E P; Siassakos, Dimitrios; Blencowe, Hannah; Burden, Christy; Bhutta, Zulfiqar A; Cacciatore, Joanne; Dang, Nghia; Das, Jai; Flenady, Vicki; Gold, Katherine J; Mensah, Olivia K; Millum, Joseph; Nuzum, Daniel; O'Donoghue, Keelin; Redshaw, Maggie; Rizvi, Arjumand; Roberts, Tracy; Toyin Saraki, H E; Storey, Claire; Wojcieszek, Aleena M; Downe, Soo (2016). "Stillbirths: economic and psychosocial consequences". The Lancet. 387 (10018): 604–616. doi:10.1016/S0140-6736(15)00836-3. ISSN 0140-6736. ↑ Lahra MM, Gordon A, Jeffery HE (2007). "Chorioamnionitis and fetal response in stillbirth". Am. J. Obstet. Gynecol. 196 (3): 229.e1–4. doi:10.1016/j.ajog.2006.10.900. PMID 17346531. Stillbirth is defined within Australia as fetal death (no signs of life), whether antepartum or intrapartum, at ≥20 weeks of gestation or ≥400 g birthweight, if gestational age is unknown. ↑ Statistics Canada ("Canada's National Statistical Agency"), History, Vital Statistics - Stillbirth Database, in Vital Statistics – Stillbirth Database Archived May 5, 2007, at the Wayback Machine..
1 2 Centers for Disease Control and Prevention. State Definitions and Reporting Requirements (PDF) (1997 Revision ed.). National Center for Health Statistics. ↑ "Gesetze". Initiative-regenbogen.de. Retrieved 2013-08-06. ↑ Bythell M, et al. (2008) The contribution of late termination of pregnancy to stillbirth rates in Northern England, 1994-2005. The British Journal of Obstetrics and Gynaecology, 115(5):664-666. ↑ "Births and Deaths Registration (Northern Ireland) Order 1976". Legislation.gov.uk. Retrieved 2013-08-06. ↑ Cacciatore, J. (2010). Unique stories of women and their families after the death of a baby. Journal of Healthcare Social Work, 49(2), 134-148. G. J. Barker-Benfield, "Stillbirth and Sensibility The Case of Abigail and John Adams," Early American Studies, An Interdisciplinary Journal, Spring 2012, Vol. 10 Issue 1, pp 2–29. The Wisconsin Stillbirth Service Program (WiSSP), a branch of the University of Wisconsin-Madison's Clinical Genetics Center. One of the foremost authorities on the causes of stillbirth and responsible for many stillbirth evaluation protocols, including the widespread use of the Kleihauer-Betke test in deciding whether Rh disease is to blame for a stillbirth.